This script illustrates the variability of the test statistic and the connection to Type I error rates and power rates for different null and alternative hypotheses. 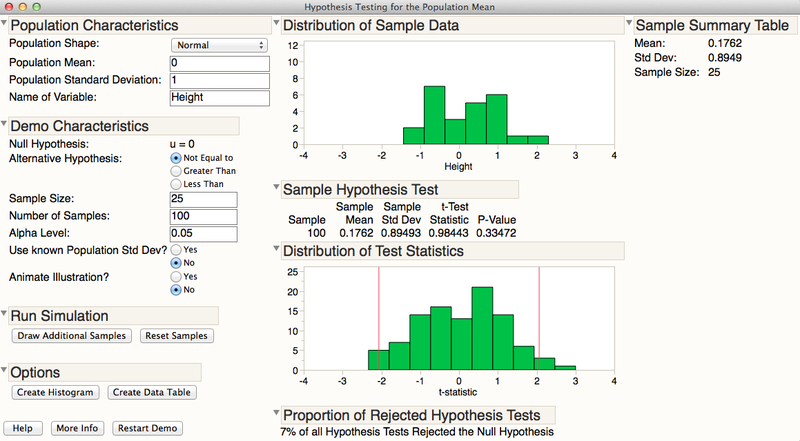 Includes controls for population shape, mean, and standard deviation, sample size, alpha level and number of samples. Suggestions? Comments? Please reach out to JMP Academic's mia.stephens. Thanks! Aug 2015: When the "Create Data Table" option is used, the script now writes out both the test statistics and the p-values to the data table. Sept 2016: Fixed an issue with test statistics, improved scaling of the test statistic axes, added the ability to specify the null hypothesized values.